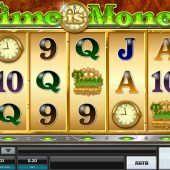 Time is Money slot is a move into the modern gaming age by a software developer who has been around for years - Realistic Games. As their name implies, previous releases were often online representations of AWP style slots with their old square flashing start and hold and collect buttons along with 1980's blue or red scrolling LED displays showing alphanumeric credit totals. The reels would be pseudo mechanical too. So, if you have ever seen their original style games this may surprise you first time you see it and you would do a double-take when you saw the Realistic logo on the slot! There are 5 reels and 20 pay lines and the theme is old mechanical clocks and inventions hence the name. As well as the gadgets you have a couple of characters dressed from the period and the rest are the standard card tiles. The symbols are all single but you can get 2 card symbols in view on a reel and the picture tiles are quite few in number - the spins remind me of the bonus feature in the slot game Dead or Alive where the letters are prolific but picture tiles scarce. The slot has a background of classical piano and string music, maybe you've heard before piped into a lift or a hotel reception. There are Time Is Money Wilds on all reels which have no multiplier and are the top 5-of-a-kind paying 250x stake. This is actually the game's cap on any one spin: the most you can get is 250x in any game, which is typical of Realistic's pays set-up on all their slots. The lowest card symbols pay 5x stake for 5. Gold clocks are the scatter symbol, and appear on all 5 reels but award no pays. Three clocks anywhere awards 12 free spins, 4 will give 24 and 5 clocks earn 48 free spins. They can be retriggered and the picture characters change for these spins, as does the background into a dull brown. The enhancement is that there is a clock and the hour hand is actually a multiplier for wins and each value can only be awarded once, so if you had a win on all 12 spins you would have one multiplied at 12x, one 11x and so-on down to 1x but not in order as the hour hand spins randomly for each win. It's a very novel idea! If all 12 hours get removed then you win the jackpot prize of 250x stake, so the retriggers and 4 or 5 scatter triggers become more important. The round is capped overall at 250x too.